This is a line of articles discussing a sailing trip from Lisbon in Portugal to Arrecife on Lanzarote. Six new yachts manufactured by Dufour of France had to be delivered to LAVA CHARTER, a charter-company with German roots operating from Arrecife. This fleet of six brand new Grandlarge sailing yachts ranging from 38 to 51 feet has been sailed by dedicated skippers well known to the company who recruited their respective crews amongst friends and committed sailors. I was offered the chance to be part of one of this crews, manning a Dufour Grandlarge 460, the SY MOJITO. 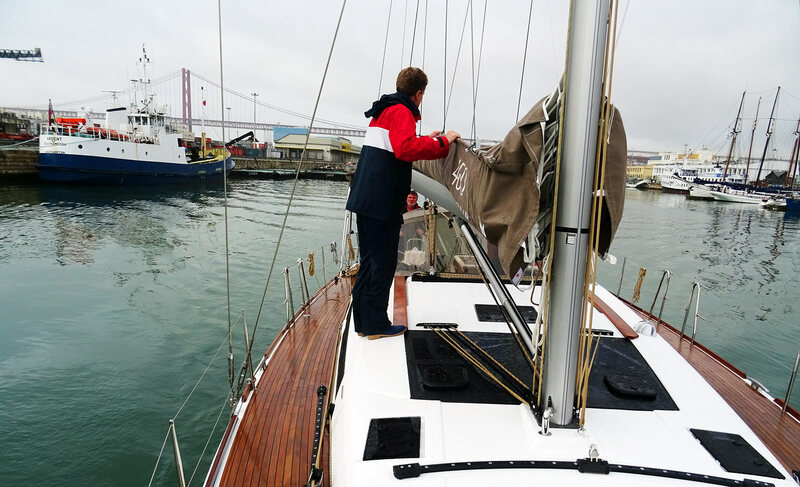 When I joined the crew of our Dufour 460 Grandlarge sailing yacht in Lisbon I was – apart from the fact that I am 38 years of age right now – the youngest pal of the team. And except from Ute, who was sailing for her first time in live, I did have the least sailing experience, just a few couple of hundred miles and of course I had never sailed for such a long stretch of time before. Not the least, all miles I had done previously have been sailed on the Baltic Sea and the North Sea. So after nearly 1.000 miles of really serious Atlantic sailing experience: What would I say had I learned from this trip? Let´s just look at the technical side of this experience first as there will be another article on the personal and professional learnings to be read. You see, the name of this magazine is not far fetched: No Frills Sailing is what I want to do. Sailing without frills. No bells and whistles, no unnecessary stuff, no waste of time, space and money. This is the exact same approach I was following when refitting my King´s Cruiser 33 – I do not want to add stuff to the boat I do not necessarily need. This applies foremost to electronic devices and “luxury” electric current-eaters such as oversized fridges, TFT-screens, generators et cetera. I love the cleanliness of a Pogo-yacht, they have also a no frills-approach to equipment, just pure sailing fun. But … yeah, there´s a “but”. And here the lessons learned from my 1.000 mile long sailing trip come into play. To some degree I must revise my views and opinions since I´ve learned that – especially when sailing single or double handed – some things are really a must-have I would have never thought them to be. Let´s start with an obvious one: Lazy Jacks and Lazy Bags. When sailing a modern cruiser, that´s an ordinary piece of equipment and I am not aware of any new purchased modern boat or rigging that will come without Lazies. But I wasn´t accustomed to these things as my own Kings Cruiser 33 built in 1975 doesn´t have Lazies. I do not care about going to the cabin roof to catch the main sail when it comes down and … well, have to work hard, sometimes even apply acrobatic skills to tame the canvas. When sailing alone and even double handed, this is obviously a serious high-risk situation! Lazy Bags are a must-have indeed! What a relief when Lazy Jacks are part of the rig! You just release the main halyard and let the sail fall down. That´s it. Nobody has to go to the mast, no catching the angry beating canvas in strong winds, no acrobatics. Just let it fall down and that´s basically it. And the best thing about it: Lazy Jacks are so simple. Just add 3 pairs of strong rope, have it lashed properly and tied to the vang and the mast and that´s basically it. Definitely something for my SY OLIVIA as well! Well, of course I do not chart plotters consider a disposable thing. Even my Kings Cruiser 33 has one. 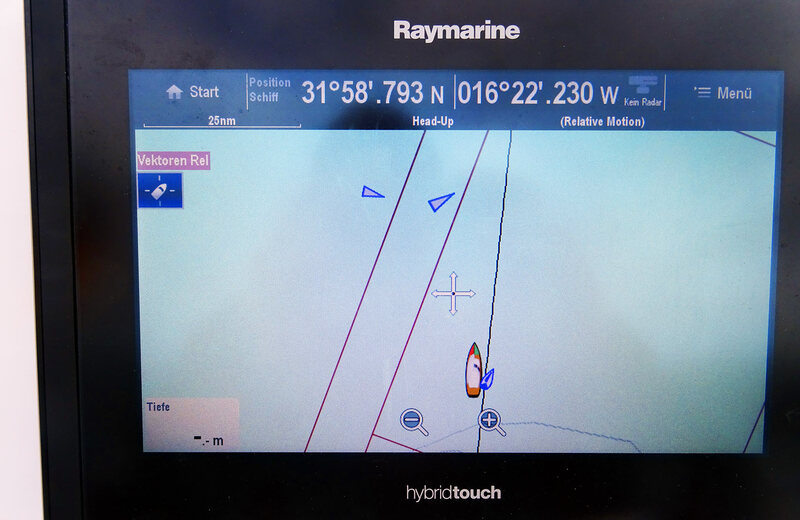 But where SY OLIVIA´s Raymarine A65 is a very, very small plotter with a screen barely bigger than 7 or 8 inch this piece of equipment seems like being from another century. In fact, it is. 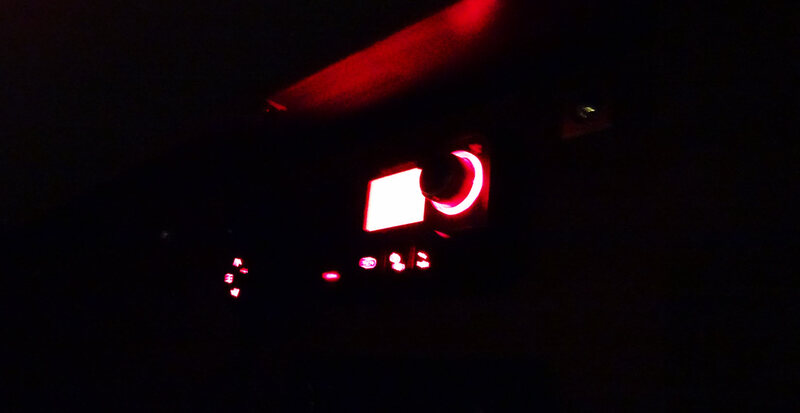 On SY MOJITO the latest generation of plotters had been installed: The Raymarine ES97. What a great piece of equipment! What was so cool about it? The size of the screen? The depth of colours? No, definitely not. It was the convenience of handling of a touchscreen. You need a new course? Just point your finger on the screen where you want to go and it will calculate the exact bearing (thus the course over ground), the distance and ETA. That´s saving so much time of course! In a matter of a wink of an eye everything is calculated. And displayed. The Plotter has it´s price: Some 2.500 Euros for the basic version plus GPS receiver and of course it needs a lot of room for installation as the size of the plotter slightly exceeds the measurements of a sheet of paper. On the other hand, it was an eye opener to me and showed me that electronic stuff must not be a bauble per se. As much as I was missing the good old chart work in paper charts at a proper nav station, having the Raymarine ES97 aboard changed the game forever. Let´s stay for a while with the electronic gadgets. 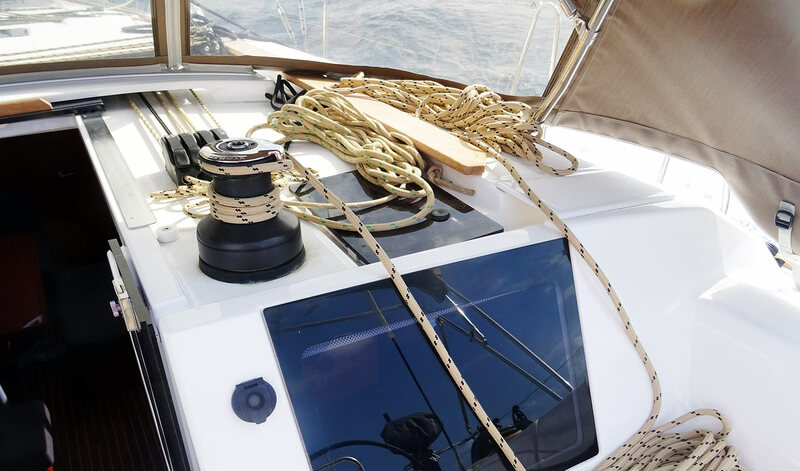 How important the acquirement of the SRC-certificate is has been pointed out in previous articles here and that a modern DSC-capable VHF-transceiver with AIS-functionality is a must have on every seagoing yacht has been outlined here in depth as well. But the combination of an AIS-capable transceiver and the chart plotter is where real magic happens. Why? Because AIS is simply something of a “better” Radar. Of course, AIS cannot show icebergs or drifting stuff, it also cannot display vessels without AIS transponder signals but as most of marine traffic (and sailing yachts in particular) feature AIS I would consider this a minimal risk. As long as you won´t sail to the extreme North or South where Radar is a must, AIS will do perfectly well. Have these data of the other vessels (course, speed, bearing, time of collision et cetera) displayed on a nice chart plotter is where it all makes sense Being alone on the watch is always a thrill of course. But being accompanied by these two helpers was making me comfortable with this situation evermore. It was a no-brainer since I was allowed to concentrate on sail trim and other stuff rather than calculating courses and sweating not to hit another ship all the time. 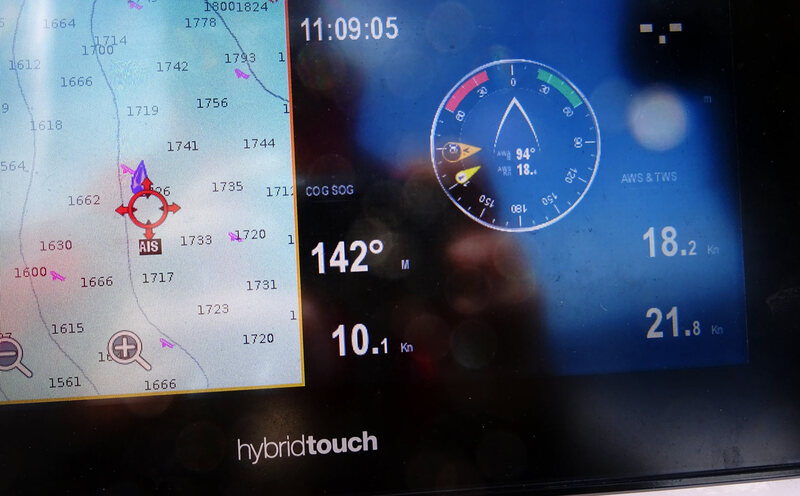 Having an AIS/DSC-capable VHF transceiver connected to a powerful chart plotter really made sailing a lot safer. For me, it´s a must-have for single- and double handed sailors. 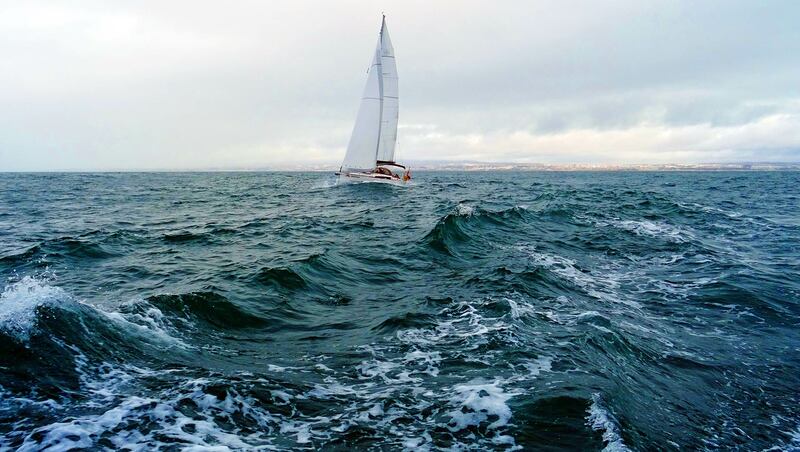 “We´re going where the wind is blowing”, that´s a word coming from every sailor from time to time. 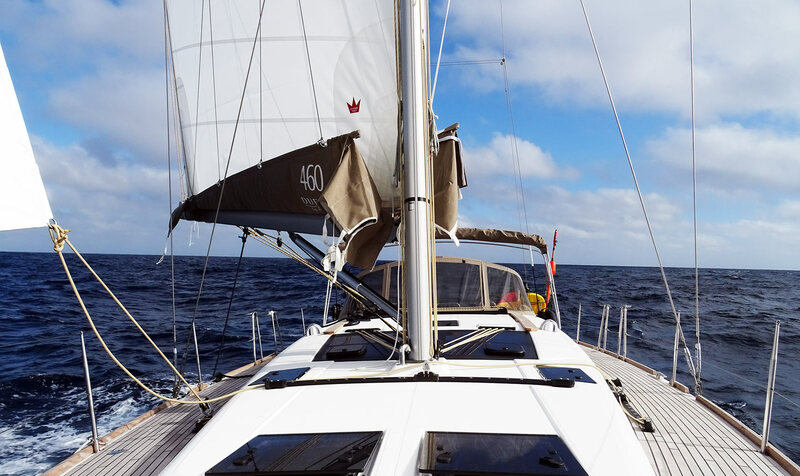 Sailing down south in the Humboldt current, pushing us with up to 1 knot and having a wind blowing from abaft seems like nothing else to do just to have the sails at running trim. 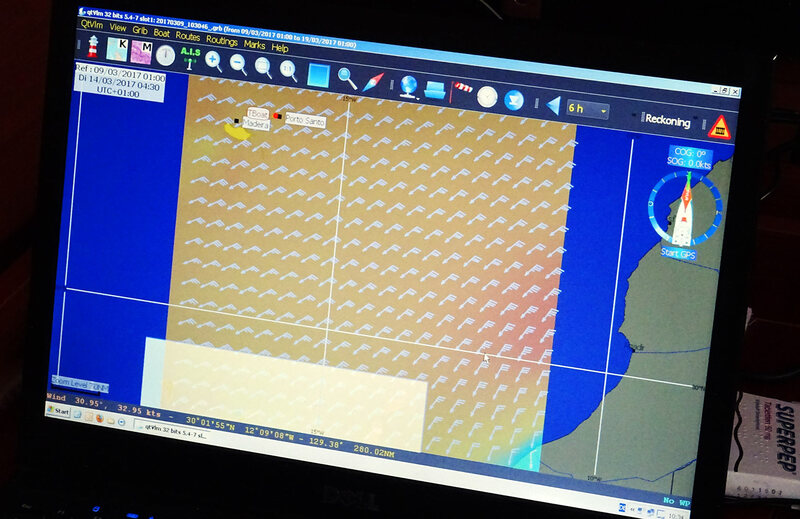 But it isn´t: As I was watching with interest as Thomas and Sven, Skipper of SY AVATAR, had their Laptops ready and running all day long not just to track our position but to feed a certain software with current weather information: A program made for regatta-sailing was then calculating the best route for the boat for reaching destinations the quickest way. And here´s how it works. 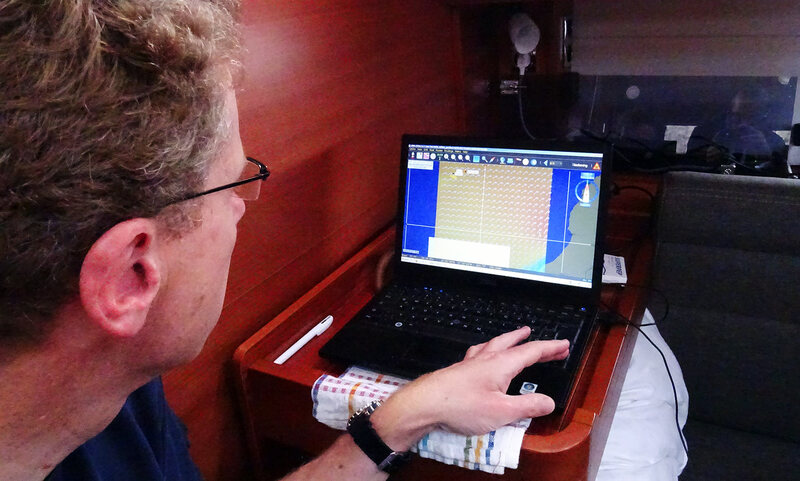 At first you´ll feed the software with the polar diagram of your yacht (read here what a polar really is). The program needs it in order to calculate at which point of sail the boat will make which speed. Then you can enter restrictive facts like: “I do not want to have waves growing bigger than 7 meters” or “I do not want to sail within wind speeds exceeding 35 knots steady” and so on. Enter the destination and – the most important – GRIB-files of the current weather situation. After some time of calculation the software will present the fastest route according to weather data and restrictions. By the way, our program was called QTVLM, I know a lot of sailors using Expedition Marine. And you will be surprised what this route will look like! 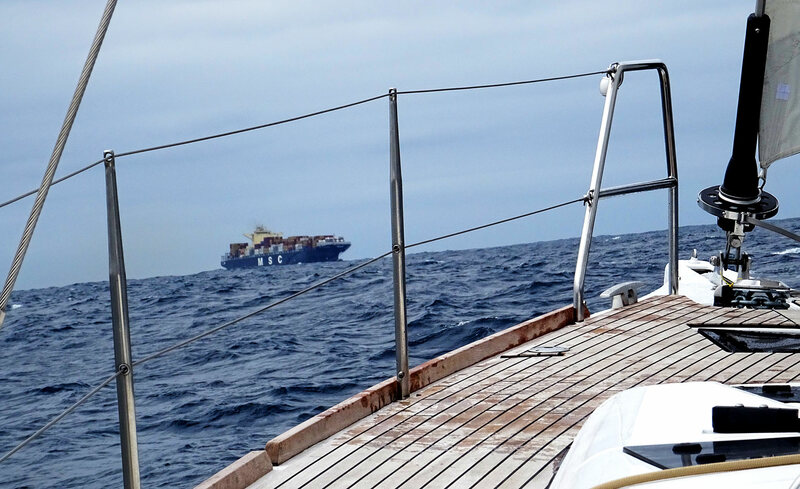 In our case the direct course from Lisbon to Porto Santo was distorted to an S-shape according to the wind patterns: The software tried to route the boat in a way so that we´d get a more beam reaching-situation, thus speeding up the transit from 5 days to fast 3.5 to 4 days. The good thing about this software is clearly visible – bad about it: You need of course a constant feed of detailed GRIB-files which means a downlink to the Internet. We renewed the data when we arrived at a new harbour but you can imagine how accurate it is to be sailing with 5 day-old GRIB files. Nevertheless, it can be a safety feature and in a situation of a race this software can (and has done it) be the thing that decides about winning or losing. Best for last: Electric Winch. That was kind of awkward, I must admit. As I entered the boat and discovered that there has been installed an electric winch I first reacted repulsive: This was exactly the kind of equipment I considered to be luxurious. Why would somebody need such an energy consuming thing when he can pull the lever and grind the winch with the same outcome? Why would somebody skip the fun of grinding anyway? Well, having gybed for the tenth time with the help of this electric winch in a matter of seconds really changed my mind. Pulling in the main sheet with the push of a button to perform a gybe alone in the dark really got me convinced. This is an absolute essential, more so if you are sailing alone. I would say, having at least one electric winch is an absolute must have on boats bigger that 44 feet. It simply makes sailing stress free, easier and gives the single handed sailor more control over situations and saves him a lot of time. Perfect thing. These five essential technical pieces of equipment are what I have finally brought with me as learnings from the long Atlantic trip on the Grandlarge 460. I was surprised by my own how this trip changed my mind especially when it comes to the “no frills sailing-approach”, which is a doctrine I was upholding for years. Now that´s changed a bit. 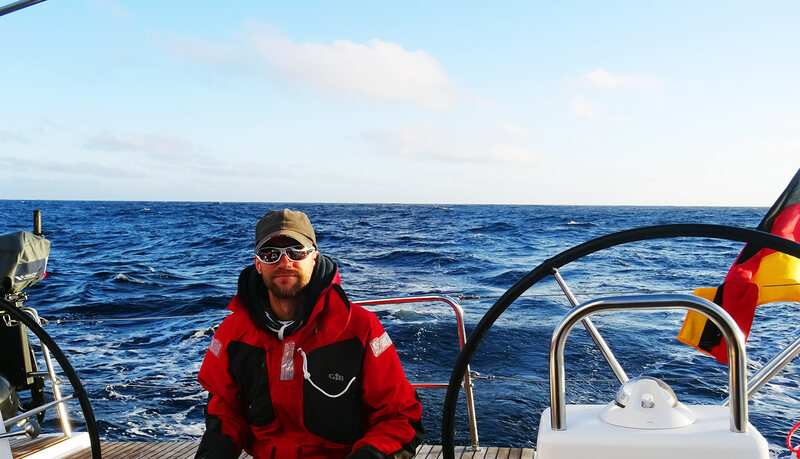 Please be tuned to read the second part of this lessons learned-series, this time about sailing skills and matters of the sailor himself. Special Thanks to LAVA CHARTER for the chance to sail on one of their boats. For information and offers on charter trips on the Canaries on these Dufour Yachts please visit www.lavacharter.com A unique and special discount for my readers of 1.5% on all LAVA CHARTER bookings may be acquired by stating web code NOFRILLSSAILING along with your booking.